Christmas, Eid, Hanukkah, birthdays or perhaps a special wedding anniversary…we all have special occasions to get excited about. Sometimes the run up to these events can be highly pressured because these momentous days needs to be just right- delicious food, gifts and coordinated photo shoots to make you the envy of all your friends! Well, there’s a similar buzz in TLN central right now…only the festive talk is about pencils, PowerPoints and resources. Yes, you’ve guessed it, CPD (short for Continuing Professional Development) time is here and we are all looking forward to getting on the road and supporting schools and local authorities with school linking. CPD or training on effective school linking and facilitating a school linking project in an area is crucial. Linking does not just happen and without clear planning and structure; it’s more than likely that linking can be counterproductive. At the heart of the Linking process, we use the ideas outlined in Social Contact Theory about the key conditions needed for effective contact that reduces prejudice. Having theory in mind when delivering training and designing programmes is the foundation of Schools Linking work. Research shows that with key conditions in place groups that meet can move from ‘Us vs. Them’ to a more inclusive ‘We’, which is essentially our aim over the timescale of each link with our ambition being for each schools linking programme moving classes from ‘us and them’ to ‘we’. Over the next few months, the network of schools linking programmes across the country will be delivering training and suggesting classroom activity that creates the positive effects of intergroup contact occur in situations which have certain key conditions in place: meaningful interaction between individuals, equal status, intergroup cooperation, common goals, and support by social and institutional authorities. Equally our training is informed by negative contact theory as we are sobered by the knowledge that negative experiences have a powerful impact on attitudes to others. This awareness of the lived experience of individual children and young people matters and in this the principle that we seek to do no harm. But there is more to the training, including resources for linking that are made by teachers for teachers, advice including do’s and don’ts discosvered through experience over time along with amazing stories about the transformative nature of linking. So, if you are a teacher or facilitator who’s involved or would like to be involved in our programme, we really look forward to seeing you soon to share our passion and expertise. 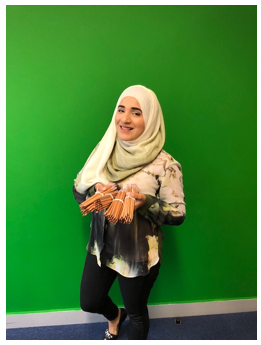 The picture shows Nahida Nazir, Bradford Primary Programme Lead getting into the festive CPD spirit at TLN central…we hope she has enough pencils!